What is Hyper Duel? 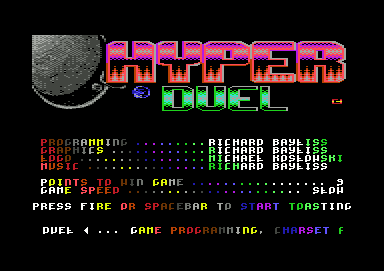 Hyper Duel is a game for 2 players only. The idea of the game is very simple, blast your opponent and survive. . Here is the source code for the game. If you want the binaries for it, then simply download the whole package from here. It also includes the source code. 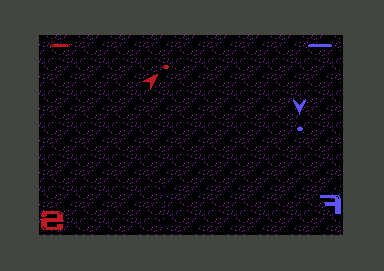 ;two players, written in ACME cross assembler. ;but the opponents can also fight back. ;but set in a weird style. p1isdead = $13 ;You can guess what this is eh? This is where player 1 is dead. 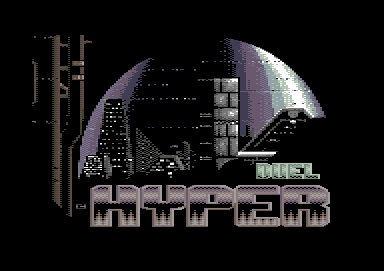 !to "hyper_duel.prg",cbm ;Target of Commodore C64 program! *= $0801 ;We shall start this as BASIC run. Okay, enough of the above bunf. The code below is for the title screen. When assembled the source, and maybe crunched it. If you really want to that is, the result should look something like the screen shot of the actual game. Except when the title is active, you will see nice colour sinus effect and also active options, etc on your C64/emu. ;Irq interrupts for the title screen. Now it is on to the game, which should turn out like the picture below. ;Set default sprite types for the game. ;which the bullet should fire if on screen. ;is turned off, else terminate routine, until bullet is offset. ;Check the direction player 1 is moving. ;to see the bullet around after it is offset. ;Because player 1 has been defeated. Time for the kill player 1 effect. ;Now for the byte tables to finish the game & title off. !scr" programming .........richard bayliss   "
!scr" graphics ............richard bayliss   "
!scr" logo ................michael koslowski "
!scr" music ...............richard bayliss   "
!scr" points to win game ................. 9 "
!scr" game speed ...................... slow "
!scr"press fire or spacebar to start toasting"